There is a new wave of Australian film-makers like David Michod whose stark and inventive crime films have the potential to shock and enthrall American audiences – but first, they will have to put English subtitles on their films so that we can understand precisely what in the hell those Australian actors are actually saying. 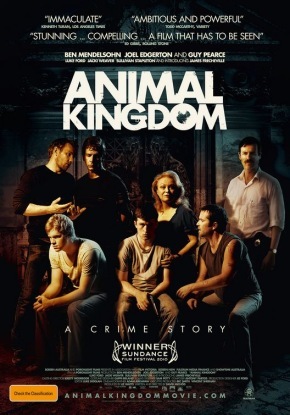 But aside from that minor complaint, there is much to praise in the case of Animal Kingdom – a dark and gritty crime story focusing on a family who make their living in the criminal underworld of Melbourne. This is David Michod’s directorial debut – and it won the Grand Jury Prize for World Cinema at Sundance. This is not just a story about criminals, this is a story about the war between the police and the crime underworld in Melbourne. Corruption is so rampant that the line between good and bad is blurred beyond repair. Enter the Cody family and Pope Cody – an armed robbery pro played by Ben Mendelsohn who is on the run from a squad of dirty detectives who read you your rights after they have unloaded a full clip in your chest. It is Mendelsohn’s eerie performance as this quietly unstable, deranged demon of a man that centers this movie and keeps the audience watching. For the entire film, you watch Mendelsohn’s character evolve from quiet armed robber to full-fledged nut-job, his already fragile psyche cracking under the pressure of being chased by the police. The movie is set to be released in New York and Los Angeles on August 13, 2010. I'm a writer, web developer and creator of The Oddness cartoon series. I've got a passion for film, music, all things tech and am always exploring new frontiers. Ummm, Australian accents are hard to understand? Really? I agree with everyone you said about the film. It’s the best film I’ve seen in 2010, except for that. Really, our accents aren’t that hard to understand.